Slight Scent. 3 to 4 Feet. June flowering. 'Viva la Vida' is something new, just now starting to show up for the garden. A cross between an Asiatic Hybrid and a fragrant Oriental, crossed back to another Asiatic, the result is a highly colored Asia-ental. 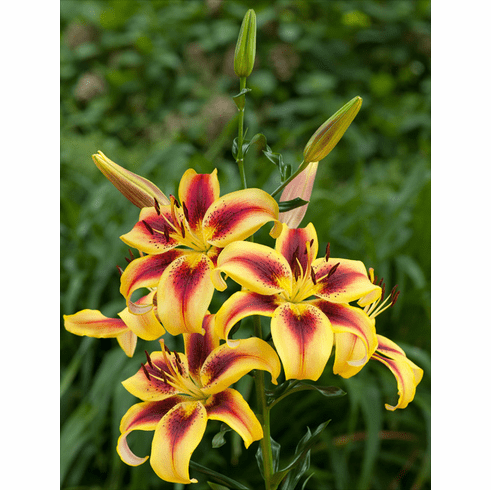 While this new family of lilies does not carry the fragrance of pure Orientals, it does give you a larger flower than pure Asiatics plus a never seen before color combination. Bulbs for spring are coming directly from the breeder. Fall crop delivery will be from bulbs harvested from our home field. June Flowering. 3 to 4 Feet. Slight scent.